As I was reflecting on the Dr. Martin Luther King, Jr. holiday, my thoughts kept circling on how an ordinary person can do extraordinary things, which was the central theme of a keynote speech that I gave in January 2011 at an Ecumenical service in Harlem, York honoring Dr. King. I underscored this theme, because I suspect that Dr. King’s parents did not have a vision on January 15, 1929 that their son, their little baby boy, would have the impact on the world that he did. He was at that moment, an ordinary baby, coming into a world filled with injustices and challenges. I am fairly certain, from all that I have studied about him, that as a high school student, or college student, he did not have a vision that he would walk himself, let alone lead thousands, into unknown territory, execute boycotts and lead marches using unfamiliar tactics and strategies, that had not been used effectively yet in this country. He was in fact an ordinary man, but he had the courage to answer the call, to say yes to the opportunity to make a difference. 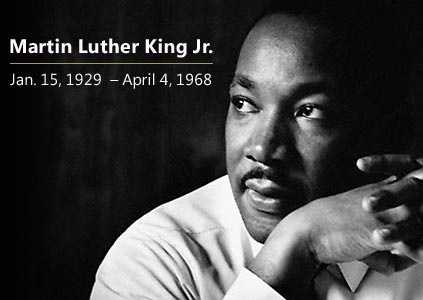 Yes, he was an ordinary man, who did extraordinary things, because he recognized the gifts that he was given, the gift of oratorical skills, the gift to recognize and build key relationships, the gift to mobilize and energize people to follow him. He recognized whose he was and depended on THE POWER for his direction and his strength. He understood that we could not be great as individuals or as a country, if we did not make it possible for everyone to have a chance at being great. While you may not have the courage of Dr. Martin Luther King, Jr. to face the unknown with the certainty of faith, or to step into situations of known danger, you can be inspired and mobilized by his passion for helping the unfortunate, his passion for universal freedom, his passion and desire for equal opportunity for every man and every woman and his passion for justice. You can honor his memory and his passion by doing your part to help someone else, which was the primary driver for all that he did. You might have a large, public platform where you can impact many, many people, or you may be able to do your part by helping a senior cross the street, by spending a few minutes with someone who may need a listening ear, or just giving someone an extra tender touch, hug, or handshake that says, “ I recognize you and I honor that you are here”. We can all do our part, every day, in small and large ways, to make this world a place where there is equal access and opportunity for all, to make it a better place for someone else, and in the process for ourselves. What a way to pay homage to one who heard and answered The Call from HIM.